GFS really likes this one. Storm2k forum is of Polandball. Wow, the GFS really does go ham with this as it nears the dateline. Showers and thunderstorms associated with an area of low pressure continue to develop around 1100 miles southwest of Honolulu, Hawaii. Although these thunderstorms remain poorly organized, upper level winds are projected to become less hostile Friday night through Saturday. * Formation chance through 48 hours, medium, 50 percent. Disorganized showers and thunderstorms associated with an area of low pressure continue to develop around 1100 miles southwest of Honolulu, Hawaii. Environmental conditions will remain conducive for tropical cyclone development over the next couple of days as it remains nearly stationary. * Formation chance through 48 hours, medium, 60 percent. 2. Showers and thunderstorms associated with an area of low pressure about 1100 miles southwest of Honolulu, Hawaii remained nearly stationary this morning. Environmental conditions will remain conducive for tropical cyclone development over the next several days. * Formation chance through 48 hours, high, 80 percent. 2. Showers and thunderstorms associated with an area of low pressure located around 1000 miles southwest of Honolulu, Hawaii have become better organized today. Environmental conditions support tropical cyclone development, and a tropical depression is likely to form by early Saturday morning or through the day Saturday while the low remains nearly stationary. * Formation chance through 48 hours, high, 90 percent. H. Remarks: Shear pattern. LLCC is less than 3/4 deg from dg shade yielding a DT of 2.5. MET is not available. PT is 2.0. FT is 2.0 based on constraints. WEST...ALONG THE SOUTH SIDE OF A DEEP LAYER RIDGE TO THE NORTH. MAY OCCUR IF THE DEPRESSION SURVIVES THAT LONG. THAN A CLASSIC TROPICAL CYCLONE. THE SOUTH-SOUTHEAST WHILE SHIPS SHOWED 23 KT FROM THE SOUTHEAST. ANTICYCLONE TO THE EAST AND A TROUGH TO THE WEST OF THE DEPRESSION. SEMICIRCLE MORE THAN 150 MILES FROM THE CENTER AT PRESENT. POST-TROPICAL REMNANT LOW ON SUNDAY MORNING. PREVIOUS TRACK AND THE TVCN MODEL CONSENSUS. REMNANT LOW THROUGH 120 HOURS. KT POST-TROPICAL REMNANT LOW WITH THIS ADVISORY PACKAGE. NEXT 24 HOURS...THEN REMAIN LESS THAN 10 KT THROUGH 72 HOURS. FEATURE THROUGH 120 HOURS...AND SO DOES THE OFFICIAL FORECAST. AND WMO HEADER FZPN40 PHFO. HEADER TCPCP2 AND WMO HEADER WTPA32 PHFO. 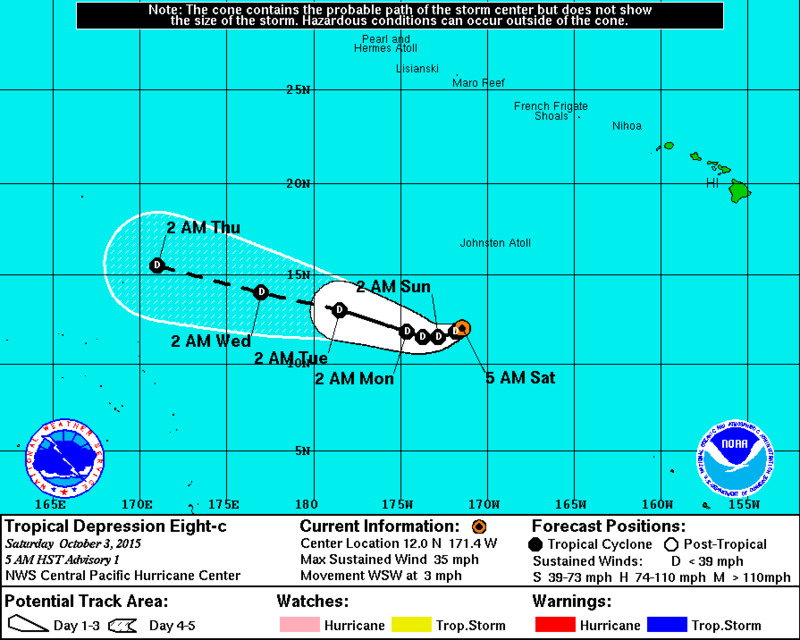 ABOUT 900 MILES SOUTHEAST OF HILO...HAWAII REMAIN DISORGANIZED. * FORMATION CHANCE THROUGH 48 HOURS...MEDIUM...40 PERCENT. 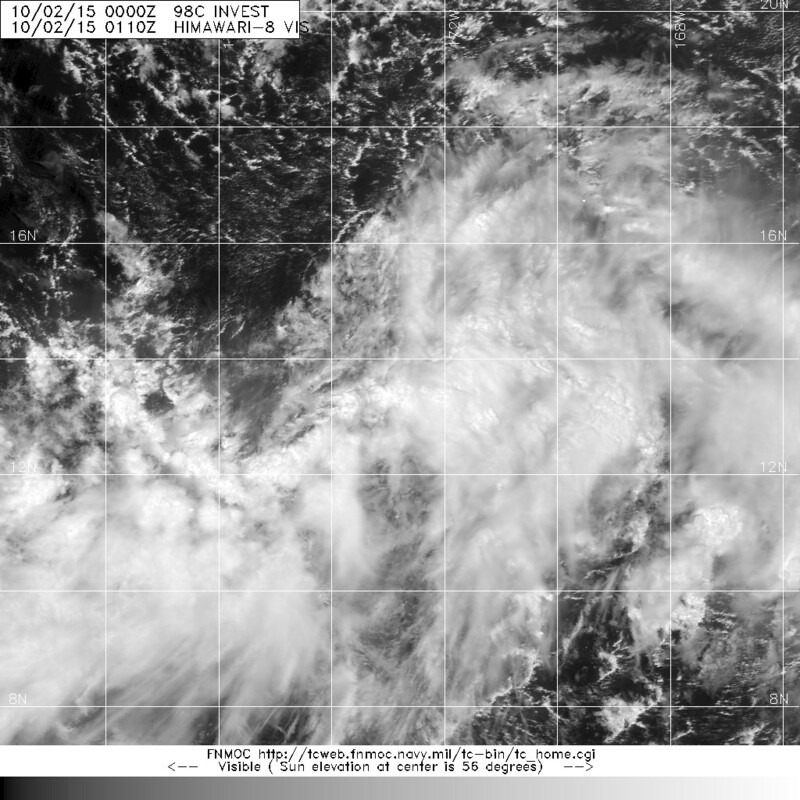 JMA has classified this as a Tropical Depression. Not much strengthening is forecast in the WPAC. In contrast to model runs from about a week ago, the latest guidance doesn't do much at all with 08C for at least a week. After that, it could find some more favorable conditions as it nears The Philippines, which is when some models redevelop it.